Stuart Davis (American, 1892–1964), Babe La Tour, 1912. Watercolor and pencil on paper, 15 × 11 in. (38.0 × 28.0 cm). Smithsonian American Art Museum, Gift of Henry H. Ploch, 1983.84. Art © T.H. Benton andR.P. Benton Testamentary Trusts/UMB Bank Trustee/Licensed by VAGA, New York, N.Y. The Armory Show was a formative experience for many up and coming American artists, including Stuart Davis. Davis is best known for his cubist paintings of the 1920s and 30s but, in 1913, he had not yet explored abstraction. Davis’ early work reflects the approach to modern painting promoted by his teacher, Robert Henri, who believed that modern art should be drawn from contemporary American life. 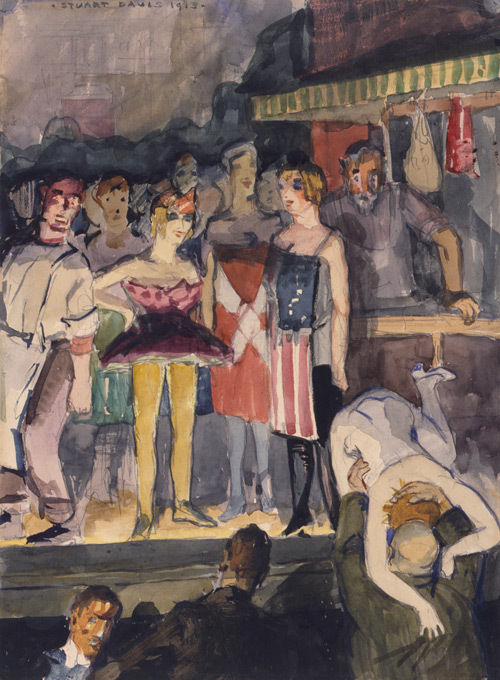 Babe La Tour, one of the five watercolors that Davis exhibited in the Armory Show, represents the working class, urban subject matter that Henri endorsed as an antidote to academic standards of beauty. Davis was not among the American artists initially invited to participate in the Armory Show. The A.A.P.S. originally planned to only exhibit the work of invited artists, but since publicity generated widespread interest, they decided that others could submit their work to the Domestic Art Committee, which was chaired by William Glackens. Davis was among a number of young or unknown American artists whose work was selected by the Domestic Art Committee, and at twenty-one years old, he was one of the youngest artists represented in the Armory Show. John James Sweeney, Stuart Davis (New York: Museum of Modern Art, 1945), 9-10.